Campaigners attempting to save Tangmere’s airfield control tower have been successful in being awarded two grants towards phase one of the project. Both grants, one from Sussex Police, have been awarded on community safety grounds and total £1,000. Lead campaigner Matt Gover-Wren said he was ‘absolutely delighted’. Heritage crime officer, PSCO Daryl Holter, was able to secure the £500 in funding from Sussex Police for the ‘Save Tangmere Tower’ group through the Police Property Act Fund. This is made up of monies received by the police from the sale of found property and from property confiscated by order of the court and then sold. PCSO Holter said: “I am really happy to help director Matt Gover-Wren and his team. The tower, which is Grade II listed and is on the Heritage at Risk register, has been derelict since the closure of RAF Tangmere in 1970 and has been the subject of antisocial behaviour and criminal damage. Matt added: “Working with Daryl has been brilliant, he visited us on site and ran through a number of recommendations and general advice going forward. He helped us better understand some aspects of preventative work and connected us with our local policing team. “I have been so thankful to Daryl for his continued support and helping us with this funding. 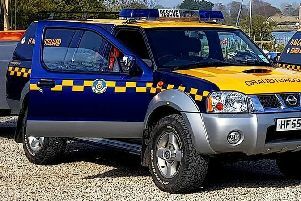 Another £500 grant for the tower campaign came from the local joint action group, the operational group of Chichester Safety Partnership which manages neighbourhood funding. It is hoped that further community grants will be available to help the project.